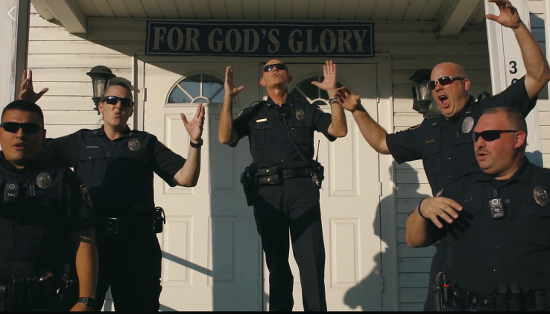 The Freedom From Religion Foundation is giving a poor review to a Texas police department’s ill-advised and unconstitutional religious music video. The Crandall Police Department recently posted a video to its Facebook page of officers lip-syncing to the evangelical Christian song “God’s Not Dead.” The department’s video included many instances of explicit endorsement of Christianity, including the police chief repeatedly pointing to the sky (while lyrics like “Now I’m lost in Your freedom” play), a spotlight on a Christian cross on the wall while the chief reads a bible below it, officers posing in front of a sign reading “FOR GOD’S GLORY,” and a shot of “In God We Trust” printed on the side of a department vehicle. Such a video violates the U.S. Constitution, FFRF informs the Crandall Police Department. “The Supreme Court has long held that the Establishment Clause ‘mandates government neutrality between religion and religion, and between religion and nonreligion,’” FFRF Associate Counsel Sam Grover writes to Crandall Police Department Chief Dean Winters. “The Crandall Police Department’s video conveys a message to non-Christians that they are not ‘favored members of the community,’” to quote the Supreme Court again. Citizens interact with and rely on law enforcement officers during some of the most urgent and vulnerable times of their lives. Law enforcement must be even-handed and avoid any appearance of bias toward some citizens or hostility toward others. Religious endorsements made by a department send a message that excludes the 24 percent of American adults who identify as nonreligious, including 38 percent of Millennials and younger Americans. The Crandall Police Department is needlessly alienating the non-Christian and nonreligious citizens in its city, turning them into political outsiders in their own community. Government employees can worship, pray, or read any religious text they wish when acting in their personal capacities. But they are not permitted to provide prestige to their personal religion through the machinery of a government office. The police department belongs to “We the people,” not the department’s temporary occupants. Our Constitution’s Establishment Clause, which protects all Americans’ religious freedom by ensuring the continued separation of religion and government, dictates that the government cannot in any way endorse religion. The First Amendment prohibits even the appearance of religious endorsement by government officials. Promoting one specific set of religious beliefs in an official department video violates the department’s obligation under the Constitution. Finally, the department’s promotion of Christianity needlessly jeopardizes taxpayer dollars by exposing the city to legal liability. Not long ago the sheriff’s office in Bradley County, Tenn., agreed to pay more than $40,000 in damages and attorneys’ fees after promoting religion on social media and ignoring objections to the practice. “There is no need to expose the department and the city of Crandall to similar liability by continuing to promote Christianity on a government account,” warns FFRF. FFRF is asking the Crandall Police Department to refrain from promoting religion on social media and take down its video tribute to the personal religious beliefs of some of its officers. The Freedom From Religion Foundation is a nationwide nonprofit organization with more than 32,000 members throughout the country, including over 1,400 in Texas. Our purposes are to protect the constitutional separation between state and church and to educate the public on matters related to nontheism.